Hello friends, I hope you’re not sick of me yet, because I have yet another codex review for you. 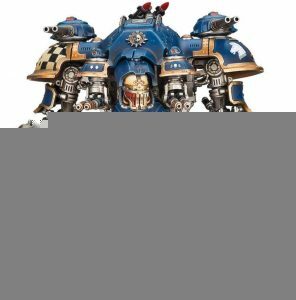 This time we’re talking about an army which has never really gotten proper love and attention (until now) Knights! Knights are unique in that they they are an army of literally only Super Heavy slots. Which makes building armies with them a tad weird, but here’s the long and short of it. Super Heavy Auc Choice: If you take 1 Knight or Armigar as a Super Heavy Aux then you cannot make use of the Knight Lance rule to make him a character, nor do you get the benefit of traditions. However you still unlock stratagems, so the meat of their utility is still available. The two houses that strike me as the best ones are House Raven and House Taranis. Taranis has built in 6+ fnp, which over the course of a 24 wound knight, effectively adds 4.66 wounds to his profile. Furthermore, it comes with the amazing strat- Our Darkest Hour. I mean, how can you not think a Knight coming back to life and then acting as though he were at full health is great!? Raven, on the other hand, has a pretty mediocre trait for knights, though it unlocks the amazing stratagem, Order of Companions. Tossing that onto a Castellan every turn will do wonders for its consistency and efficiency. Super Heavy Detachment With Armigars: If you take a Superheavy detachment with let’s say a Knight Warden, a Knight Valient, and an Armigar Warglaive, that little guy will cost you 3cp. Any super heavy detachment of knights will unlock all your strats, give you access to the Knight Lance rule (so you can have WL traits and Relics), and give you access to traditions, however the inclusion of any Armigars into the detachment will remove all the CP benefit you wold have received. Super Heavy Detachment With 3 Knights: This is literally as big as it gets! With this you get all the special rules Knights have to offer and 3cp! Hopefully that clears up all the details about how to make Knights detachments for you! And, now that all that’s covered, let’s go over some controversial and new units the knights have to offer. Armigars- I’m not crazy about either Armigar to be honest. The shooty one is very similar to a Leman Russ Tank Commander with battle cannon as far as points/damage output, which leaves them in the category of decent but not ground-breakingly good. 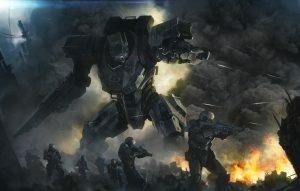 The Warglaive is nice as a mid field shooty/combat threat, however it might fill a role that Imperial armies just aren’t looking for. They are pretty similar to shield captains in functionality, and they come in at a similar price point, but with the detriment of being shootable and not having fly. 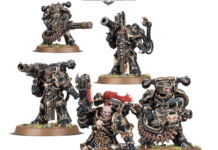 I could see people taking a pair of these to accompany another knight in a super heavy detachment. I could also see people attempting to spam the shooty Armigars, as their mobility and fire power are solid, but with no fly mechanism, I really think these will fall short. 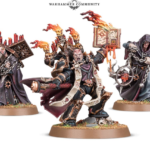 I could see people inserting 3 into a guard or ad mech army to provide some solid fire power for the points, but I’m just not overly impressed with them aside from some niche usage and slot fillers. 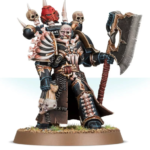 Knight Gallant- These guys are super easy to overlook with all the new fancy toys Knights have, however I strongly recommend giving them the respect they deserve. A house Terryn Gallant can move 12 and run 2d6 pick the highest +2″, then charge after the advance with +2″ for just 1cp and the associated WL trait. That’s an effective 16″ + 3d6 charge range! In combat it can unload 15 stomp attacks or 5 sword attacks depending on the target, and then of course, fight twice. 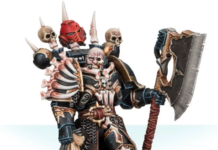 Let’s not forget, that since he will be in the other guy’s army when he goes down, you can take the other guy with you. For just 1cp he can explode on a 4! This is the definition of a kamikaze knight for just 354! Knight Castellan- They said save the best for last, so that’s exactly what I did. This utter monstrosity is the true behemoth in the book! Holy shiitake mushrooms thats a ton of shots. But wait, there’s more! 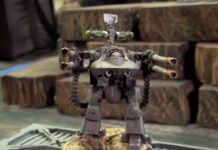 If you make this little guy House Raven for the stratagem to reroll all ones (including number of shots for his weapons) you’re now averaging a ton of autocannon equivalent shots, and you make yourself fairly immune to whiffing that volcano lance or plasma stuff. Let’s not forget he’ll be hitting on 3’s rerolling 1’s and rerolling 1s to wounds. It’s not all sunshine rainbows and puppies for Knights though. As I’m sure a lot of you may have realized, a lot of the cool tricks and combos I’m talking about require a ton of CP, and Knghts don’t exactly lend themselves to spamming battalions. 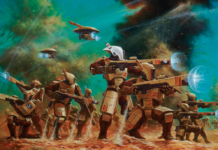 That said, they live in the lovely world known as the Imperium, and therefore they have access to the humble infinite CP guard brigade. 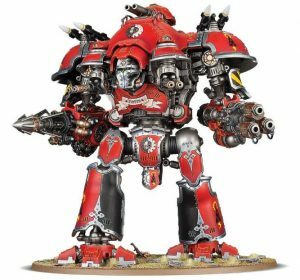 Competitively speaking, I think adding Knights to a more balanced force that can support them will see you with a lot more success than you would see with just taking your big toys out by themselves. 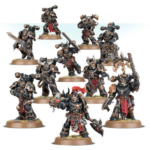 Here’s really quick sample list of an army that has lots of options and the ability to adequately support knights. I added a guard battalion to a knight army to help give it bodies to help against incoming smites, and give it more CP and some ability to regen CP. 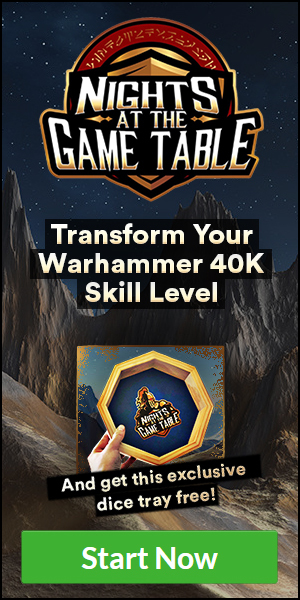 I’d probably spend 2cp before the game starts to make the Castellan the warlord for a 4++ which you can buff to 3++, and then also buy him the relic for 2+ armor. 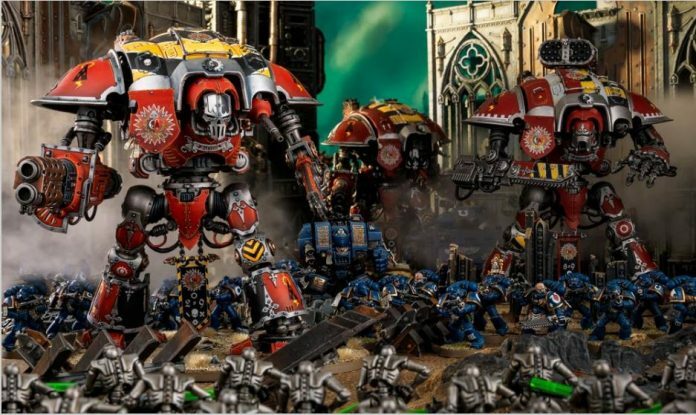 Run the two Gallants forward and use them as distraction carnifexes while the Castellan and the Crusader go to work shooting people off the table. If you liked this article, and want to learn more about Knights, become a pro, and enjoy my weekly clinics on Imperial armies! Previous articleExclusive One Time Sale on Nights Pro Coaching!